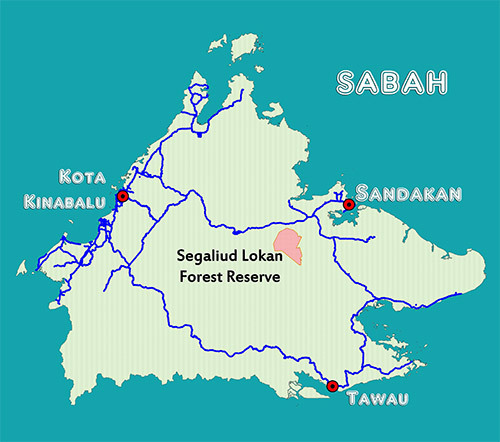 Segaliud Lokan Forest Reserve is managed in accordance with the sustainable forest management principles. The forest reserve is certified under MC&I (Natural Forest) by MTCS and EMS ISO14001. Forest Management Unit (FMU) No. 19 was gazette as Class II Commercial Forest Reserve in year 1984. The FMU was divided into two parts which are FMU 19(A) Deramakot Forest Reserve and FMU 19(B) Segaliud Lokan Forest Reserve (SLFR). SLFR is situated on the south west of Sandakan, between Longitudes 117° 23’ E and 117° 39’ E, and between Latitudes 5° 20’ N and 5° 38’ N. The forest management unit is managed by KTS Plantation Sdn. Bhd. awarded with Licence Agreement by the State Government of Sabah. The initial objective of this forest management was to establish Industrial Tree Plantation through full land clearance and planting with fast-growing mono timber species. However, the forest management strategies were revised in 1998 by adopting natural forest management in the Industrial Tree Plantation zoned areas. The commitments were demonstrated in the first and second Forest Management Plan (1999 – 2018) approved by the Sabah Forestry Department.